YOU NEED THIS RETROFIT KIT! Hands down, the most useful modification ever. We just purchased a CPO F56 and it didn’t come with the load floor option. We have an older dog purchased this kit so that we would have a level floor for her on road trips. LOVE IT! I typically drive with the new trunk floor in the lower position and that gives me plenty of storage under the lid for the dog blanket, a flashlight, umbrella, reusable grocery bags, etc. TONS OF ROOM for storage and a nice neat lid to cover the stuff I keep in the MINI. The adjustable floor (lid) is super sturdy. There is nothing flimsy about it. Cool things I didn’t realize I’d get with the kit… 4 tie down rings! They are awesome! I have no idea what I will use them for yet but now I can bungee cord things down so they won’t slide around when I zip through town (following the speed limit, of course). All in all, a great buy! Easy to install too, it only took about an hour. This is a review of the M12 stud conversion kit for the R53 MINI Cooper S. This is the second stud kit that I have installed. The first set was of much lessor quality and was totally worn out within six years of auto-x, track days and winter tire change-over. These new studs appear to be far superior and slightly longer. I also like the unthreaded portion that allows lining up the nut to help prevent cross threading. I do have one question; Do you recommend any using any lubrication on the threads of the studs? Synopsis: Don't be caught empty-handed! You can't use just any pen to write that list of things you love about MINI Coopers! Make your MINI proud with one of these writing utensils. 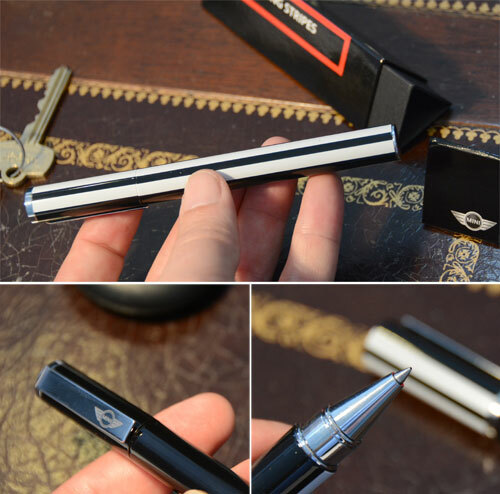 MINI Cooper Pen + Case - sleek. stylish. classic.